Since a significant number of alternate history novels rest on such huge leaps of faith, the premise of J. Gregory Keyes’s Newton’s Cannon isn’t so outlandish. In this novel, the turning point of history is in 1681 when Sir Isaac Newton, father of physics and calculus, unleashes a substance called Philosopher’s Mercury, that allows alchemists to manipulate the four basic elements of Air, Earth, Fire, and Water, thus achieving a breakthrough in the ancient art of alchemy. The events of Newton’s Cannon take place 30 years later. English scientists have managed to harness the power of alchemy to the point where their armies are closing in on Paris, and the elderly King Louis XIV, still alive thanks to an alchemical elixir he took 20 years earlier, has his scientists working frantically to develop any sort of weapon that will allow the French forces to repel the British offensive. Against this backdrop, we meet a teenage Benjamin Franklin toiling in his brother’s print shop, learning whatever he can of this still relatively new science. His dabbling in this new art catches the attention of Trevor Bracewell, who tells Ben to cease his inquiries if he values his life. Like any good adolescent, Ben defies him and is soon forced to flee Boston, his life in jeopardy, his brother dead, and his best friend possibly murdered. Understandably distraught, Ben does the only thing he can think of and flees to England, hoping to find Sir Isaac Newton in order to show him some of his discoveries and breakthroughs based on alchemy. Once there, Ben quickly finds himself caught up in events peripherally related to the war raging between England and France. The unusual premise of Newton’s Cannon separates this novel from the run-of-the-mill alternate history novel. Keyes is careful to make sure that the boundaries of this science are well defined. As a result, the characters, many of whom are actual historical scientific figures, believably treat alchemy as a real science, with results that can be quantified, measured, predicted, and duplicated. This is not witchcraft or “magic,” something that the novel’s characters scoff at as impossible. Another nice aspect of Newton’s Cannon is the character of Adrienne de Mornay de Montchevreuil, a woman of the French court with aspirations to higher learning. In many ways, she is the type of woman who would do well in contemporary society: she’s smart, confident of her abilities, able to handle herself well in difficult situations, and generally an interesting person. Unfortunately, she lives during the Age of Unreason (as advertised on the book cover), and she must hide certain aspects of her life in order to exist peacefully within her society. Equally unfortunately, she is somewhat attractive and discovers that King Louis is enamored of her and wishes to make her his wife. Luckily, the Korai, a secret political society of proto-feminists, is there to help her through the situation. This is fortunate because they manipulated things to put her in such a position in the first place. Newton’s Cannon has a couple of other things going for it. As far as alternate history novels go, the period covered by this novel is relatively unmined. Also, Keyes displays some wit in this novel: Franklin’s first foray into alchemy-based machinery yields what he calls a harmonicum, a device that partially relies on a principle similar to the one the harmonica, a real-life Franklin invention, operates on. And although they never meet, the intertwining plots concerning Ben Franklin and Adrienne keep the novel moving at a decent pace, and the obligatory cliffhanger that concludes the novel (the cover advertises “Book 1 of the Age of Unreason”) falls at just the right place. If you’re caught up in the events of the novel, the ending definitely leaves you wanting more. Unfortunately, there is a chance that the novel may not leave you wanting more. The characterization, with the exception of Adrienne and Ben, is rather weak and, for the most part, two-dimensional, with very little in the way of complexities. While there are some engaging descriptions of life at Versailles and in London during the time, they’re nothing that truly adds to the common person’s understanding of the era. Also, one of the points the novel makes, that most scientists don’t think enough of the possible ramifications of their actions, is rather worn and tired, and there’s nothing special in the way that this point is made. And while the results of the novel’s culminating event surprise and shock the characters, they are utterly predictable for almost any attentive reader. For most, Newton’s Cannon will be nothing more than a pleasant diversion. While many alternate history fans will enjoy reading a novel that genuinely tries to present an original scenario, I was left wishing that Keyes had applied more of that originality to many of the characters. 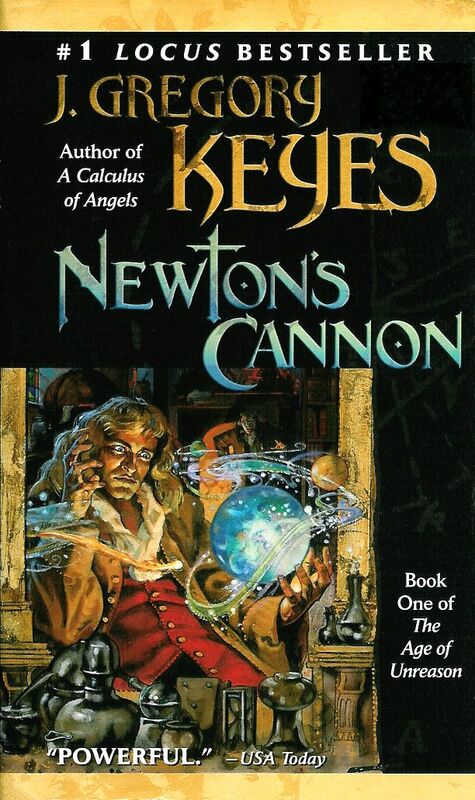 However, as plot-driven novels go, Newton’s Cannon is enjoyable, and as far as first books of series go, Keyes has done an excellent job of setting up this universe-he has created a scenario with plenty of promise, one with which he could conceivably take some wonderfully ambitious risks. Hopefully, Newton’s Cannon will be the weak link in the series. This entry was posted in Book Review, J. Gregory Keyes. Bookmark the permalink.